Each year, The Grange residential care home for the elderly in Wickford, Essex, focuses on fundraising for a selected charity for the whole year, to donate and make a difference to the lives of others in need of support. 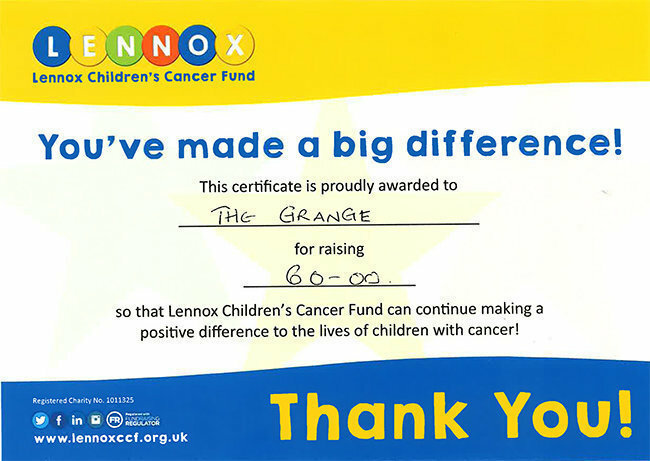 In 2017, The Grange raised money for the homeless, in 2018 it was for breast cancer research and care and for 2019 the professional care team have decided to raise money for Lennox Children’s Cancer Fund, to help make a positive difference to the lives of children diagnosed with cancer. In just one month, The Grange has managed to raise £60 and will continue to fund raise throughout the year to support the assistance that the charity is able offer to families when they need it most.